Mr Warsh and Mr Poole (who was filling in for Allan Meltzer) made a sharp distinction between the “legitimate” efforts to fight the crisis and the subsequent easing actions that were, allegedly, unjustified by the economic fundamentals. According to them, the interventions of 2007-2009 were required to ensure that “the markets could clear”, as Mr Warsh put it, while the second round of easing was done to satisfy “political masters” by monetising the debt. In fact, Mr Warsh said that the Fed was being actively unhelpful by “crowding in” Congress’s supposedly poor policy choices. My first response is how can they can say this with historically-low U.S. treasury yields and muted inflation expectations? Surely, if the Fed were truly monetizing the debt we would be seeing a 1970s-repeat in the bond market, but we are not. And this is happening, in part, because the Fed is not that big of a treasury purchaser. Consider the figure below. 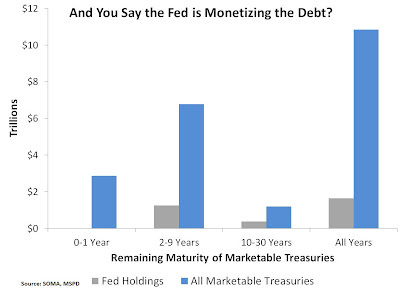 It shows the Fed's stock of treasuries by remaining maturity compared to the total stock of marketable treasuries as of the end of October, 2012. Though the Fed's share of treasuries increases by remaining maturity, at most it hits 32% of the total for 10-30 years category. That means that after many months of Operation Twist that roughly 68% of long-term treasuries are still held outside the Fed. Overall, the Fed holds about 15% of marketable treasuries as seen in the "All Years" category. It is hard to square these numbers with the allegations that the Fed is monetizing the debt. In 2011, the Federal Reserve bought 77 percent of new debt issued by our government. We are already resorting to inflationary finance. 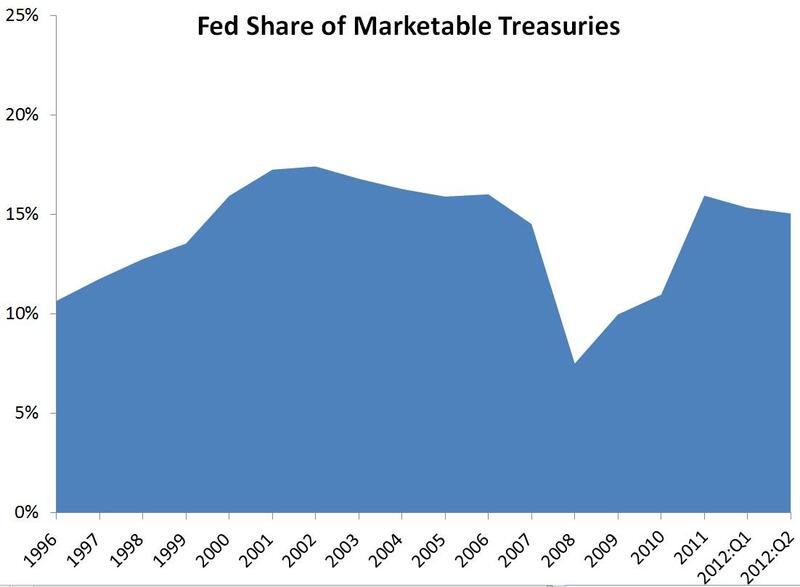 While the Fed did purchase a large share of new treasuries in 2011, these purchases only returned the Fed's share of total marketable treasuries to its pre-crisis level as seen below. Again, not exactly a picture of debt monetization. So stop accusing the Fed of monetizing the debt and enabling the large budget deficits. And stop blaming the Fed for the long decline in treasury yields. If anything, blame the Fed for allowing treasury interest rates to fall, but that is a different story. Update: JP Koning says we need to carefully define what debt monetization means. OK. So over the past week, the Fed closed on $60 billion in MBS purchases from the Primary Dealers. At the same time, the Treasury floated $45 billion in unscheduled Cash Management Bills, for which the Primary Dealers were almost the exclusive buyers. Each month the Treasury floats about $70-80 billion in net new debt. Each month the Fed closes on the purchases of about $70-80 billion of MBS from the Primary Dealers, who then use that cash to fulfill their obligation to purchase the new Treasury debt. But the Fed isn't monetizing the debt. No sirree Bob. No it's not. Why not? Because you said so. And you're an economics professor. That's why. Lee, take a deep breath. I am claiming there is no monetization not because of my profession but because as of the SOMA data as of October, 2012. As I noted above, only 32% of the 10-30 year and 15% for all remaining treasury maturities held by the Fed as that date. Look at the SOMA data for yourself. Yes, the Fed is buying agencies but that is not the claim I am addressing. But even on that front there are several important points to note. First, these actions are not changing inflationary expectations. Don't you think the other 85% of treasury holders would respond if they really believed the Fed was monetizing the debt? Second, the agency purchases are conditional. They will stop as soon as the Fed sees unstable inflation or full employment. So the Fed really can't monetize the debt under these criteria. The point is the Fed is monetizing the treasury debt directly and indirectly. They're purchasing long-term treasuries per Operation Twist. They've been providing the banks with interest-free loans for up to 3 years to purchase debts with duration < 3 years to hold risk-free till maturity. Wow, your way off. The FED purchases of primary dealer debt isn't going into treasuries at all. Look elsewhere. Perhaps it would be a welcome thing to do something as "irresponsible" as that, at least in some small measure. Today, at the New York Economic Club, Bernanke acknowledged that the 2% inflation target is a long-run target and it made feel a little better; except he went and ruined it by talking the same trash about financial crisis appearing out of nowhere, housing being a huge problem in the recovery, what a wonderful job the purchases of MBS in QE is doing of stimulating the housing sector, and how all the different heads winds still remaining means we're not anywhere out of the woods yet. It's frustrating to hear that kind of talk, still denying monetary policy had anything to do with this nightmare, trying to be more positive about the prospects of recovery and getting to a place where we can get away from the ZLB without plan with enough gusto to get us there. Monetization only matters if the government is perceived to be insolvent. In the case of insolvency, monetization (or a central bank guarantee of public debt) means that the central bank doesn't have a priority claim on tax revenue, and therefore the central bank is insolvent too. The insolvency of the central bank triggers a step function increase in the price level. Monetize is a word that needs to be explicitly defined. All banks engage in monetization, whether they be central banks or private banks. To monetize means to "turn into money". Banks monetize houses, debt, promises, commodities, and all sorts of other assets, issuing liquid liabilities in return. So to accuse a bank of "monetizing" is like accusing someone of breathing. The pejorative form of monetizing seems to be subsidization. That's when a bank monetizes assets at a rate that benefits the borrower. Just because the Fed is monetizing government assets doesn't mean it is monetizing in the pejorative sense. Where's the proof? As David points out, where's the inflation? David, one question. Although you defend the Fed against the charge of monetization, isn't monetization (in the pejorative sense) what market monetarists want? To buy assets above their market value is what gives a central bank its power. That's what turns a central bank into Nick Rowe's Chuck Norris, no? Also, I sent you a question via email. Did you get it? If not I'll append it to the comments section of this post. JP Koning, great points. Yes, at least the threat of some monetization is implicit in Market Monetarism. And should the threat work then the actual amount of monetization should be minimal. I did not get your email. Did you send it to my david.beckworth@gmail.com address? Aha! I sent it to an old yahoo address. Resending. A fascinating post, and i congratualte Beckworth. But I think monetizing the debt is great idea, and we should explicitly say so. We are able now to monetize the federal debt and (evidently) spark no inflation, in fact Cleveland Fed is reporting lowest expectations ever. There are two great shibboleths, hoary and grand, in modern-day economic thinking. One is that central banks should be independent and the other is that monetizing the debt is a sin. But with the central bank monetizing debt, they are becoming a part of the US Treasury in fact. And should not transparency and accountability be the hallmarks of any democracy? Better the Fed put FOMC meetings on CSPAN and answer moderated questions for one hour at conclusion. And better the Fed Chief serve under the Treasury Secy. (Side note---even when the Fed buys non-Treausries, they are monetizing the debt in some regards, Eventually, they will have to sell or cash in at maturity their securities, and return the proceeds to the US Treasury thus reducing debt. I know I speak heresy, but the final steps forward for Market Monetarism will be Fed transparency and accountability, and the shameless use of monetizing the debt when appropriate. Again, your enthusiasm and energy amaze me Ben. You are the Energizer Bunny of monetization! So where does monetarization start? When the Fed owns 100% of all securities? This is as ridiculous as the BoJ, which is also claiming not to "monetize" the debt. Asked what would constitute monitization the answer was "when the market tells us so". In the narrow definition the Fed is exchanging MBS and Treasuries for excess reserves. It's the Treasury who spends money into existence. But the Fed is the key enabler. The remaining 85% of Treasury owners? C'mon, they are mostly other central banks, price-insensitive and involuntary buyers of Tsy's for lack of better use for their involuntarily acquired dollars in an attempt to prevent their currencies from strengthening. And some hedge funds believing the -1 correlation between Tsy's and the SPX will serve as a low-cost hedge. Gloeschi, how is the Fed the key enabler? On what basis do you make this claim? The other 85% are not mostly other central banks. Foreign holdings is at about 48% (down from 51% in 2008), of which only some are foreign central banks. Others include private foreign investors reaching for safe assets. U.S. financial intermediaries (banks, pension companies, hedge funds, etc.) hold about 23% and individuals about 8%. To the extent these intermediaries are investing on our behalf, we hold more influence over treasury prices and interest rates than the Fed with its 15% holding. The FED doesn't want a run on the dollar like the late 70's. It was the reason why they "waited" until the crisis got so bad to do something. They could have averted it entirely if they had acted in August of 2007 when the crisis really began to balloon. But they waited, through the winter, spring and summer. The economy finally crashed in the fall of September 2008, making it possible for the FED to "monetize" bank debt while a equal if not greater amount of money was being destroyed in other sectors of the economy allowing a balance. The decline in long term treasuries is the idea of "zombification". That the current system is comfortable with no inflation(outside commodity sectors) and low rates. Sorta buddies of each other, so they keep on "flying to safety" in droves. The banks have had their debt monetized while others must suffer. Gold standard for us, free money for them. Not even the Cato Institute believes in ratex, apparently. The subject of debt monetization frequently enters discussions of monetary policy. Debt monetization is usually referred to as a process whereby the Fed buys government bonds directly from the Treasury. In other words, the federal government borrows money from the Central Bank rather than the public. Debt monetization is the process usually implied when a government is said to be printing money. Debt monetization, all else equal, is said to increase the money supply and can lead to severe inflation. However, fear of debt monetization is unfounded, since the Federal Reserve does not even have the option to monetize any of the outstanding federal debt or newly issued federal debt. As long as the Fed has a mandate to maintain a target fed funds rate, the size of its purchases and sales of government debt are not discretionary. Once the Federal Reserve Board of Governors sets a fed funds rate, the Fed's portfolio of government securities changes only because of the transactions that are required to support the funds rate. The Fed's lack of control over the quantity of reserves underscores the impossibility of debt monetization. The Fed is unable to monetize the federal debt by purchasing government securities at will because to do so would cause the funds rate to fall to zero. If the Fed purchased securities directly from the Treasury and the Treasury then spent the money, it's expenditures would be excess reserves in the banking system. The Fed would be forced to sell an equal amount of securities to support the fed funds target rate. The Fed would act only as an intermediary. The Fed would be buying securities from the Treasury and selling them to the public. No monetization would occur. To monetize means to convert to money. Gold used to be monetized when the government issued new gold certificates to purchase gold. In a broad sense, federal debt is money, and deficit spending is the process of monetizing whatever the government purchases. Monetizing does occur when the Fed buys foreign currency. Purchasing foreign currency converts, or monetizes, that currency to dollars. The Fed then offers U.S. Government securities for sale to offer the new dollars just added to the banking system a place to earn interest. This often misunderstood process is referred to as sterilization. What will happen to the Fed's holding if at some point the market outside the Fed determines to sell off/reduce a significant portion of its prior holdings? Currently the US financial system has many inherent advantages in the dollar being the defacto reserve currency - but now that China and Russia, among others are beginning to trade outside the US dollar, what will happen, when those advantages dissipate or disappear altogether. Where will people then flee for safety? This mountain of debt, and the Fed's portion of it, will be hard/impossible to hold together over time, and the Fed's percentage will get larger and larger, unless they want to risk there not being a market for the massive amount of US securities needed now and into the future. The implications of that, and of the unwinding of the Fed's massive position in the overall US securities market which has tripled since 1996, is hard to imagine. 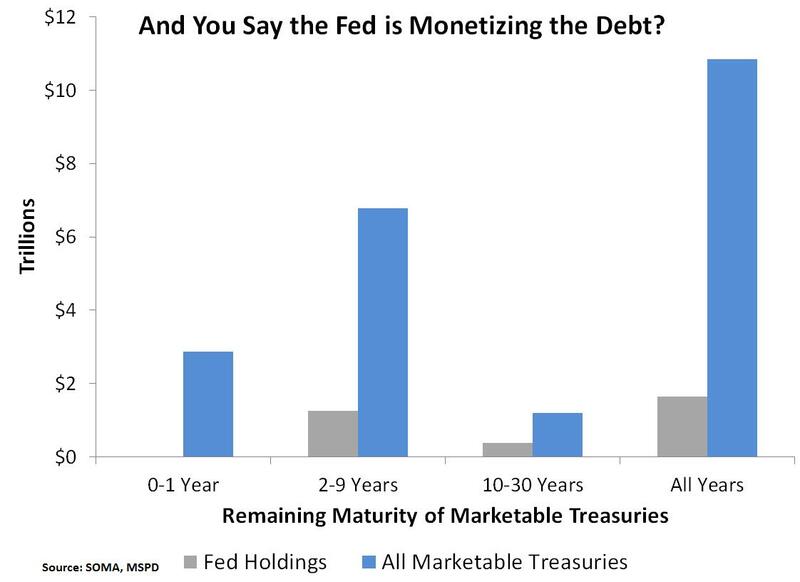 SeattleBruce, when discussing debt monetization it is best to talk about marketable treasuries not all public debt as you have done in the first graph. When you do this you get about 30% to individuals and their financial intermediaries, 15% to the Fed, 49% to foreigners, about 5% to state and local governments, and 1% all else. It is important to note that not all the foreign holdings are foreign central banks. Also, state & local holding of marketable treasuries should not be lumped in the same category as the Fed. State & local governments hold most of their treasuries in pensions because they are safe assets not because they are attempting to subsidize the federal government. If there were more privately-produced safe assets they would hold some of these instead. I agree with you that we have a serious debt problem with regards to unfunded liabilities. However, in the short-to-mid term it is less clear that this is a problem. The reason is that that world economy has grown faster than its ability to produce safe assets. Consequently, the world turns to the U.S. as a producer of safe assets. Until places like China, India, and even Europe now can produce the needed amount of safe assets to meet growing global demand, the U.S. will be the go to place. And of course the safest asset is U.S. public debt. Aha, I crossed wires a bit speaking about ownership portion of US debt, vs. marketable securities in that chart, but agree that the long term outlook for US and developed country debt worldwide is unsustainable (and why not throw in resource dependent growth) - and as you say 'a serious debt problem'. I think regarding marketable US securities holdings, it's also good to look across time at the FED's portion - what this time series video from 2003 to this year describes as FED vs. Private Sector, but clearly it's more like Fed vs. Non-Fed, as in my view the Non-Fed holdings are clearly not all private. It's still quite instructive though, and builds on my theme of 'unsustainable'. When something is unsustainable, it will cease functioning at some point, and there may be many ways this market will break down. Would love to hear thoughts on this post. Great information shared by you, thanks for the update. I cannot believe I am reading this moronic drivel. If the Fed buying treasuries is not monetization, then let the Treasury sell $100 Trillion dollars to the Fed. The Treasury can then buy every share on every stock market and all buildings/lots/property too. The simple fact is that the USA has military power, and this is why the pointy-headed professors discount Fed purchases. If the Thailand Treasury Dept issued $100 trillion dollars in debt (that was purchased by the Thailand Fed), then started buying downtown Washington DC property with those dollars, the US military would be sailing to Asia within hours. Come back. You are too far away in outer space. How much money has the fed digitally printed since the start of this downturn?Trillions.Fanny/Freddie/AIG/Companies and banks around the globe.Hold the rates to zero and screw all the honest people who save their work hours for use when needed(retirement).Too big to fail,make them even bigger.The fed wants transparency(LOL).Lots of fancy names for all those hidden fed programs. This thing is going to end very ugly for people who believe in this ponzi. the zero hedge crazies have arrived! Don't have anything to add, but I've been a big fan of this blog for a while. Just wanted to say thanks and keep up the good work. Thanks ChargerCarl. Yes the Zero Hedges have arrived. Here's hoping they look at the facts laid out in the post. Your being complimented when they slapping the zero hedge label on you! Debt monetization is not debt monetization based on the various effects it has on things like interest rates and price inflation, or quantity of bonds bought by the Fed. These are all arbitrary subjective criteria. One person may say that the existing interest rates and price inflation are higher than they otherwise would have been without the OMO, in which case to them the higher interest rates and price inflation are attributable to the OMO make the OMO "debt monetization." Debt monetization is simply, and only, the practise of central banks buying outstanding debt (before it matures) with newly created money. That's it. The effects of debt monetization on things like interest rates and price inflation, is a secondary matter. This secondary matter is also one of degree, not an on-off switch, such that if interest rates go above a (arbitrary) number, say 5%, or if price inflation goes above a (arbitrary) 3%, then that means debt monetization is all of a sudden taking place. Monetize debt means what it ostensibly means: "Transforming" debt into money. This occurs every time the Fed buys a bond. Now, if debt monetization really does occur whenever a central bank buys a bond, does this mean that you think it would lose its significance, because it would imply that all central banks all over the world are engaging in debt monetization pretty much all the time? Yes, yes it would imply that, but that shouldn't be a reason to not accept it. Just because a new understanding of a concept becomes one where it is more general than before, it doesn't mean we shouldn't call a duck a duck. Prior to slave emancipation, slaves weren't even considered humans. If someone said "slaves are humans too! ", would it make any sense to say "Oh come on! If we start calling slaves humans, then that means EVERYBODY will be humans! The whole concept of "human" would lose its significance. Let's keep things the way they are, so that we can be continue to think that the masters are humans." Debt monetization has been occurring on pretty much a daily basis for a very long time. It only becomes prominent in the news and in the collective consciousness when the amount of debt monetization increases above "normal" rates, and is used to "combat recessions." Actually, instead of "quantity of bonds", I should have said "percentage of bonds"
If I look at 2011, I see a US budget deficit of 1.3 Tillion (T) & trade deficit 533 billion (B). So using the accounting identity government deficit spending = foreign savings + pvt sector savings, we can say the pvt sector in US lived 767B below its means in 2011. In fact this tells us that the US Gov accounted entirely for the trade deficit in 2011. We can assume that the trade deficit came back in the capital account as foreign treasury purchases at 533B. So in 2011 who picked up the the 767B Pvt Sector Surplus? Now we see in the very same period that the QE2 = 600 - 700 B. So, it seems to me, that in 2011 the US budget deficit was covered by 533B foreign + FED + tiny amount US pvt sector. Fed is funding USGov deficit spending ? It does not seem valid to me, to use the analysis of total marketable securities over the historical timeframe. Whereas what is relevant is the here and now, as the Fed becomes an ever increasing part of that pie. Just ran across this article and I am sure I am not as bright as yall but isn't the fed just supporting our deficit spending through the purchase of treasuries. How is this not monetizing, is your argument that because it is portional and supposed to be temporary therefore not monetization? I think the whole think is just delaying the inevitable if they would have let market forces work we would have hit bottom in 2008 but would have been roaring back by now. A Great Vacation or a Great Recession? Steve Hanke: a Market Monetarist?